Blending wines has always been a bit of mystery to me. How do winemakers know what to combine to create the desired result? Is it an exact science? Is it based on what they have barrels of lying around that they need to move? Or is this where the talents of the winemaker really get showcased? I took a wine blending seminar with our friends at Cinder Winery to find out. We met late on a Saturday morning, greeted with a splash Viognier to wake up our palates. Eighteen or so of us moved into the back production area to find spots at tables where wineglasses and tasting sheets awaited. 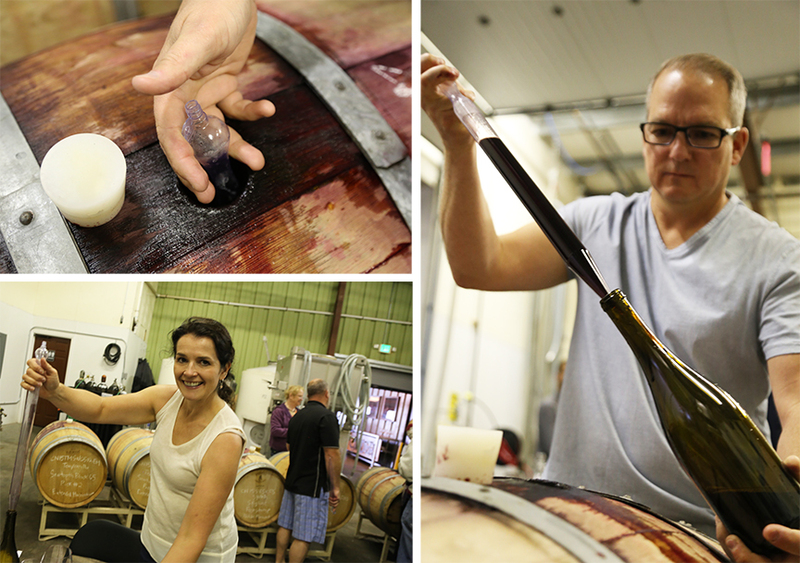 Winemaker Melanie Krause explained that we’d be working with 2015 wines that had finished fermentation last September and October and that she will bottle next spring. 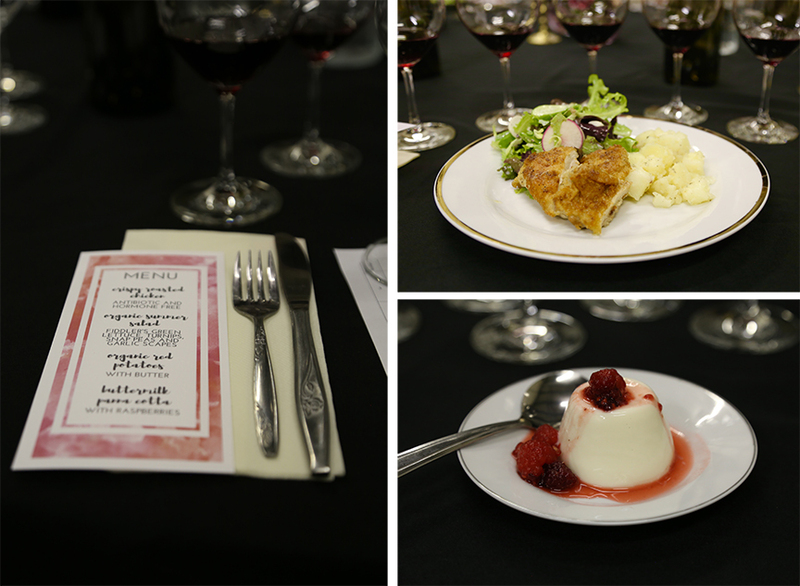 The three components a winemaker is working to balance are texture, aroma and flavor. Tannins – come from the grape seeds and brings the sensation of dryness comparable to eating an underripe banana or drinking black tea. Acid – think mouthwatering and tartness. Alcohol – when the alcohol is high it can add a burning sensation and is described as “hot”. There’s five components to the aroma profile, also known as the “bouquet”. Flavor is influenced by the varietal of grapes, of course, but flavor can also come from the wine barrels and the yeasts used in the fermentation process. If you’ve ever read the tasting notes on wines you know the flavor descriptions can get pretty crazy – everything from leather and pencil lead to jammy and acidic (and those are the more conservative ones). Malbec: Lifts aroma, makes wine bigger and extends the finish. Cabernet: Are the shoulders of a wine – big and strong. Tempranillo: Adds earthiness but also bright red fruits like cranberry. Can be powerfully tannic. Mourvedre: Brings a nice black pepper spice. Can be tannic in hot years but more likely to bring balancing acidity to the finish. May also help lower the pH. Syrah: Powerfully flavorful, intensely fruity and or savory. Its tannins are silky compared to the much rougher, more drying tannins of Cab, Merlot and Tempranillo. When I think of blending, I think of using different varietals but even in a single varietal there can be blending. Fruit from different vineyards, different fermentation techniques and different barrels will all contribute different flavor properties. In the US for a wine to be labeled as a single varietal it must be at least 75% of that grape. All this education is making us hungry but Wild Plum solves that by serving an amazing lunch (I’m still dreaming about that crispy chicken). Full and happy it’s time to try our hand at blending. 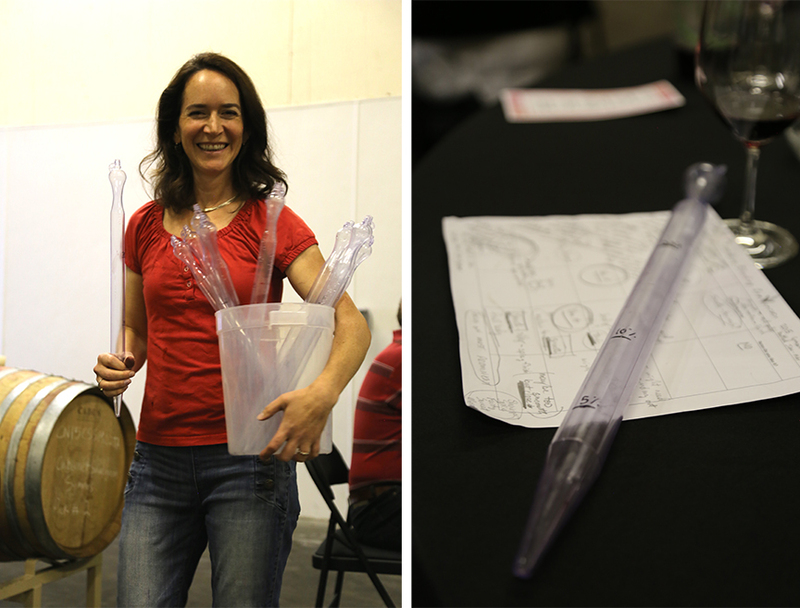 Melanie hands out the tool used to get the wine out of the barrels – called a “thief” because it steals the wine. After doing some preliminary blending in our glasses Devin and I are ready to start making our bottles. 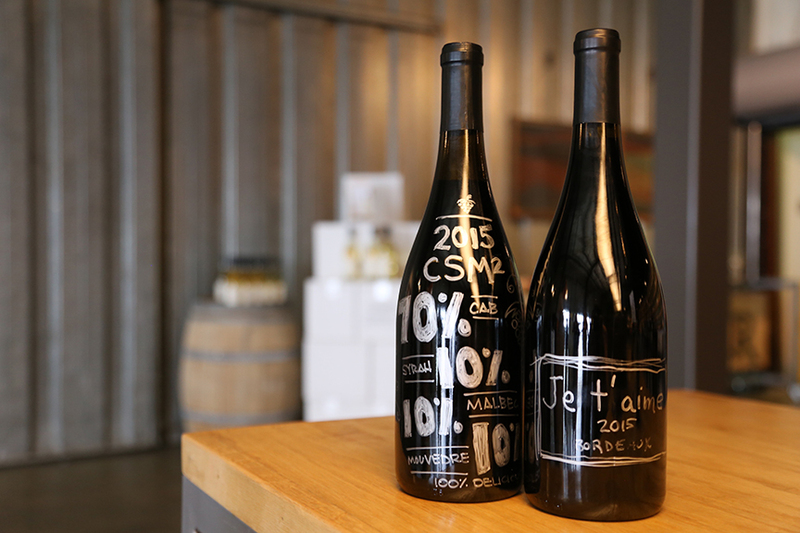 Label artwork was created with metallic pens and we wrapped up the day by each presenting our wine and our blend. Our masterpieces are tucked away in the cellar now. After wine is bottled it goes through what’s called bottle shock, so we want to make sure to give them time to calm down, meld and age. My CSM2 is a blend of 70% Cab, 10% Syrah, 10% Malbec and 10% Mourvedre. Devin made a Bordeaux blend, which he called Je t’aime, consisting of 60% Cab, 15% Syrah, 15% Malbec and 10% Mourvedre. 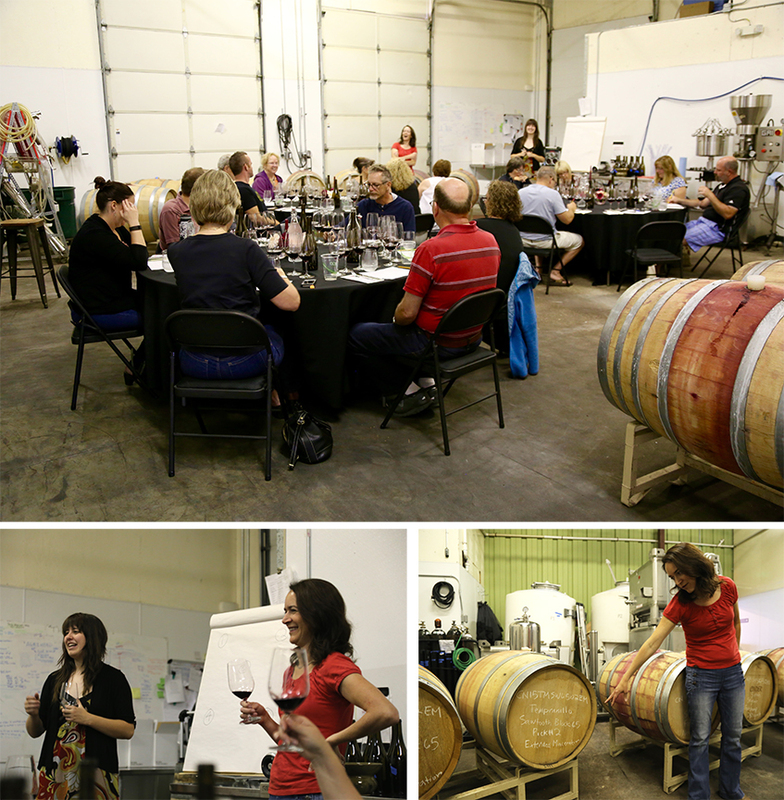 The wine blending seminar at Cinder was educational and delicious, not to mention a whole lot of fun. Plus it came with a really cool souvenir that I’ll be excited to open in two or three years. Good thing Cinder has lots of great wines to drink while I wait. Cheers!